Cassie Slafkes uses a new Scan, Bag, and Go app at City Market for the first time, just two days after the store incorporated the new technology. Slafkes says she has five children and thinks the new app helps move customers in and out of the store more quickly. Glenwood Springs’ City Market joined a list of grocery stores across the U.S. in rolling out the new Scan, Bag, Go technology, which affords customers a different shopping experience. Instead of unloading groceries onto a conveyor belt and having a cashier ring up each item individually, or going through the self-check line item-by-item, shoppers can now, if they choose, scan items as they shop throughout the store with the new hand-held device. 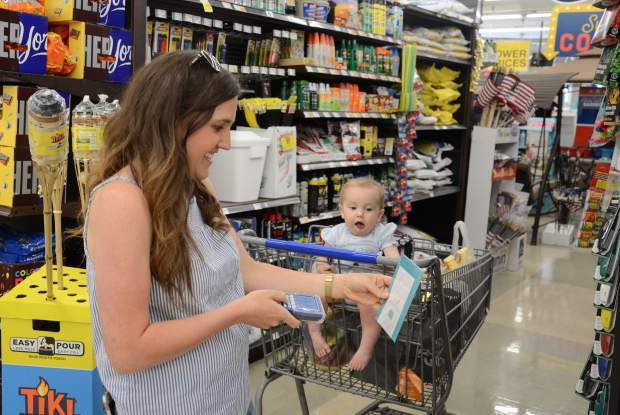 When shoppers enter the store, a greeter, from 9 a.m. to 9:30 p.m. daily, will offer customers the new hand-held device and answer any questions they may have. Then, after logging in, the Scan, Bag, Go will present the weekly ad, any digital coupons available at the time and potential points a customer has earned. From there, shoppers can start scanning their desired items as they pick them up throughout the store. “You pick the item up, you can scan the barcode on the item, it is going to show you the price of the item and the savings of the items. You keep doing that all through the store,” Martin said. What about items priced by weight? First a customer, as at any other grocery, would simply scan the item’s barcode. Then after picking out and scanning all food priced by weight, shoppers will push their cart over to one of the store’s five scales. Upon completing their shop, customers then head over to self-checkout. From here the shopper scans the barcode on the self-checkout system, which will bring up the customer’s order on the screen followed by selecting your form of payment, and then your shopping experience ends. A Scan, Bag, Go app also exists for both Androids and iOS mobile devices, which can expedite the process even further. “If you download the app onto your phone, you can actually use your phone as the vehicle to scan the items in the store. With that app … you can attach your credit card or your debit card to that app and you can actually pay for your items on your phone so that you can skip self-checkout,” Martin said. Instead, the customer would simply show the self-checkout attendant the code on their phone to verify the payment. When asked if any current employees would lose their jobs as a result of the new Scan, Bag, Go technology, Martin told the Post Independent just the opposite. In fact, according to Martin, for the Scan, Bag, Go, the store has hired on three new associates. The Scan, Bag, Go devices also allow customers bilingual options. And customers not comfortable using the new technology can still go through regular check out aisles. “Here in Glenwood we definitely have the clientele that would definitely enjoy using this type of technology. I think it will go over really well here,” Martin said.